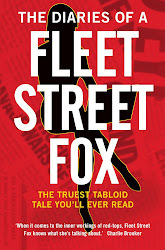 fleet street fox: The best stories are never told. A HERO soldier, dragged through the courts for attacking an enemy in the middle of a war zone? Normally a story like that would make front page news and provoke a scandal that would pitch the Armed Forces against the judiciary and lead to a political bunfight about who's right and wrong. Remember Lee Clegg? That dragged on for years. But not this time. The story broke on Sunday and has been mentioned briefly here and there, but most of you probably have not heard of it for two simple reasons: firstly it happened in Afghanistan where journalists cannot operate freely, and secondly because the soldier in question was a member of the totally secret Special Forces. He's accused of beating a Taliban prisoner and is facing a full court martial next month. If he's convicted, the chances are he'll spend a short time in military jail and although he has already left the forces he will have a black mark forever on his service career. And whatever happens, we'll never know about it. The facts, such as we know them, are these: Special Forces were on patrol with Afghan troops when two men on a motorbike rode at them head-on. The driver, who was armed with a pistol, refused to stop and was shot dead. The passenger was captured and given to an Army corporal to look after while his colleagues mopped up the mess. He says the prisoner tried to escape and got a single punch for his trouble, causing "minimal injury". The corporal reported himself to the authorities and was immediately sent back to Britain where he was arrested and charged with assault. He has since left the Army in disgust, and the prisoner has disappeared into the Afghan dust. Now, I've known more than one member of the Special Forces and I admit some of them are no-neck grunts I wouldn't trust with plastic cutlery, much less a gun. But most are the brightest and best picked from armed services which are already considered - not just by themselves - to be the best in the world. They're not like the Yanks, schooled to shoot anything that moves while shouting "HOO-AH! "; they're taught to engage brain before flicking off the safety. The Special Forces regiments and their support units are trained to within an inch of their lives, not just physically but mentally as well, and while they'll happily drink a pint of their own piss and fight an entire police station they're generally a professional, if homophobic, bunch. The fact the corporal reported himself for overstepping the line proves that. But all he's had in return is a smack in the face. Even bearing in mind the possibility there may be more to the tale - that there were several punches, that the prisoner wasn't trying to escape at all, or maybe that the corporal reported himself only because he was caught in the act - it is still not 'prisoner abuse' on quite the same scale as Abu Ghraib. And personally I can't see the soldier did anything wrong. Had the same thing happened on the streets of Britain, a policeman who walloped a prisoner would be investigated. Without witnesses or a victim he'd be cleared, and have the right to speak about what happened. But in Afghanistan - where we are asking hard men to do a difficult job in circumstances most of us cannot imagine, without the right kit and on low pay - we expect our guys to put their lives at risk while demanding they behave like vicars. What was the soldier supposed to do, ask the prisoner politely not to escape? The Special Forces live by their code of silence; it protects their colleagues and families, as much as their work. They forgo their freedom of expression for our sake but in this instance that sacrifice is being repaid with disdain. Disdain from the Service Prosecuting Authority, which is persisting in a ridiculous decision to prosecute such a minor offence; disdain for the public who rightly expect that justice is open and public; and disdain for a man who is likely to be cleared of any wrongdoing but denied a voice to decry the way he has been treated. Because of the secrecy which surrounds this part of the military our newspapers are barely able even to gather enough details to stoke a national scandal over the way this tiny incident has been handled and the unreasonable persecution of a man who had an otherwise-unblemished record. So if this is the only place you get to read about it, I'd just like to point out that a servant of the Crown is being tried by the courts in almost total secrecy for something I bet most of us don't have a problem with. 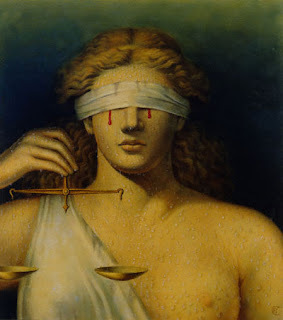 There are none so blind as them who cannot see.